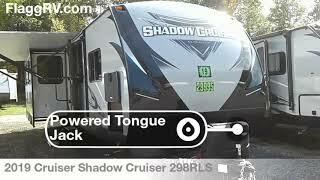 Hi, I am interested in your 2019 Cruiser Shadow Cruiser (stock #99042) listed on Autotrader for $28,995. I'd like to get more information about this vehicle and confirm its availability. This Shadow Cruiser travel trailer is a wonderful addition to any outdoor getaway. With its ability to sleep seven people, this unit provides enough space for you to bring along the entire family. As you prepare a hearty breakfast for the hungry crowd, you will appreciate the addition of the kitchen island that allows you to have a bigger work space for you to chop up veggies and clean up afterwards. Because this unit has two slides you will find the extra room enjoyable for lounging each evening in the open-concept living area, and the front, private bedroom will be your favorite spot to unwind after a long day in the hot sun.